When I saw Molly Wizenberg’s article on sweet potato biscuits in December’s Bon Appetit, I immediately ripped out the recipe with the hopes of baking a batch soon. Several weeks later, I finally got around to it and my only regret is that I waited so long. Slightly denser than a regular biscuit, these sweet potato biscuits are mighty fine and perfect for the holidays (at least what’s left of them!). The recipe in Bon Appetit was for small, bite-size biscuits, but frankly small biscuits depress me so I went big. I like biscuits that require savoring that you can’t gulp down in one quick bite. That being said, a petite version of these biscuits with a little ham would be a smashing hit at a cocktail party. If you go that route, just be sure to make several batches. They’ll go quickly! Aside from super-sizing the biscuit, I adapted the recipe by adding a little more sweet potato (1 lb instead of the 3/4 lbs the original recipe called for) and fresh thyme leaves. I also substituted the buttermilk with whole milk as it was what I had on hand. The result is biscuit nirvana. Slightly sweet, buttery, and tender these biscuits are hard to stop eating. So we didn’t even try to resist and gluttonously ate them as an accompaniment to a roast chicken dinner, with butter at breakfast, and toasted the next day with a slice of ham! If only I had made more. Making biscuits is very similar to making your own pie crust. You use the same technique to cut in the butter. Preheat the oven to 425 degrees. Grease a pie plate or cake pan with butter. 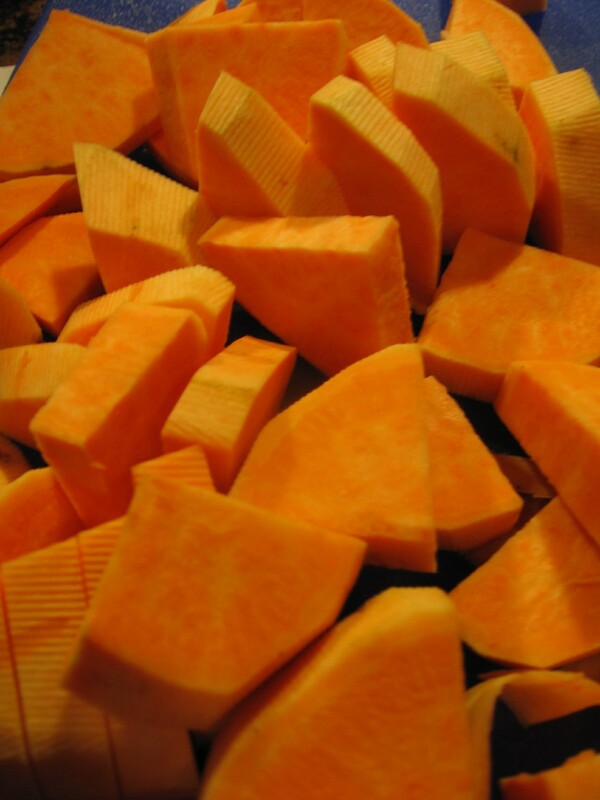 Cook the sweet potato chunks in a medium saucepan in boiling salted water for about 10 minutes or until tender. Drain the sweet potatoes and return them to the saucepan. Mash the sweet potatoes with a potato masher or fork until very smooth and allow to cool. It’s important to let the sweet potatoes cool before you add them to the flour mixture as warm sweet potatoes will melt the butter thereby inhibiting the biscuits’ ability to rise. In a large bowl, whisk together the flour, brown sugar, baking powder, salt, baking soda, and cayenne pepper. Using two forks or a pastry blender, cut in the butter until it is in pea-sized pieces. Whisk the milk and mashed sweet potatoes together and gently stir into the flour mixture. Using your hands, quickly knead together the dough until just combined and turn out on a well floured surface. Shape dough into a 1-inch thick round. For big biscuits, use a large round biscuit cutter (I used a four-inch cutter) to cut out the biscuits. For small biscuits, use a 1 1/2 inch round biscuit cutter. While it’s tempting to twist the cutter when cutting out biscuits, don’t do it as it will seal the edges of your biscuit and prevent proper rising. 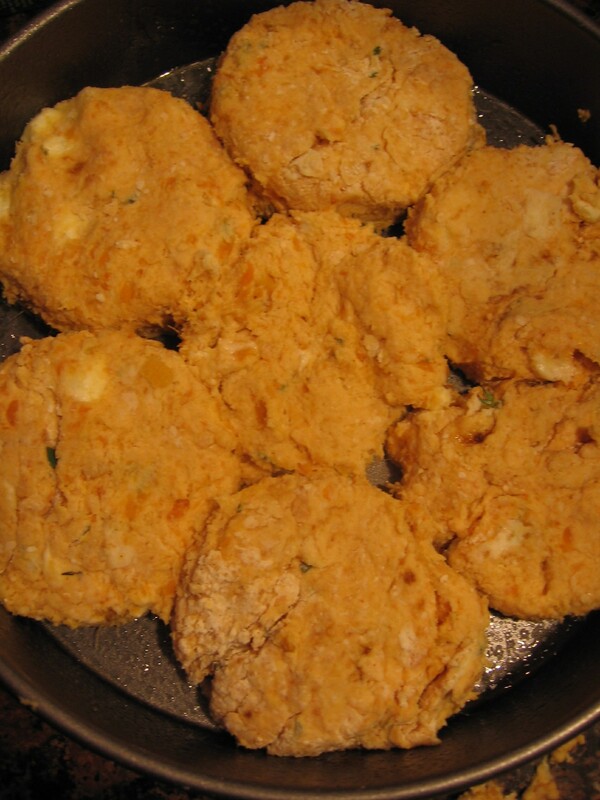 Place the cut out biscuits in the greased baking dish and bake for about 20 minutes. Remove from the oven and, if you have great self-control, allow the biscuits to cool slightly before eating. Enjoy! 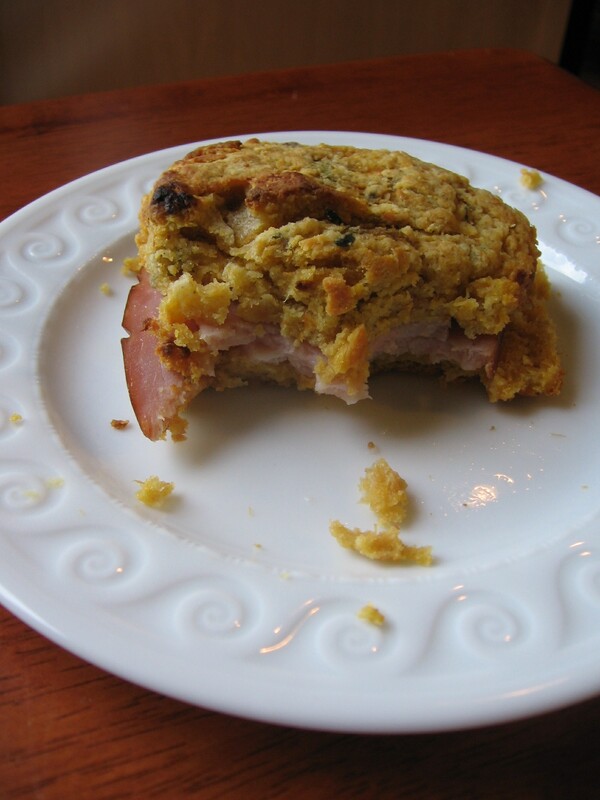 I have always loved sweet potato biscuits. These look the best! I will have to bribe myself to not make a double batch! I made them for Christmas dinner and were great! The cayenne pepper really gave the biscuits a nice spark. Thanks for a great recipe!